The medical name for canker sores is Apthous Stomatitis. These sores are different from the commonly occurring ulcers in the mouth. The sores are a result of infection and make it very painful to talk or to consume food. The sores also don’t respond well to the spices and herbs present in the food. Since canker sores are a result of infection, it is best to treat them as soon as possible or they can spread from one area of the mouth to another very rapidly. 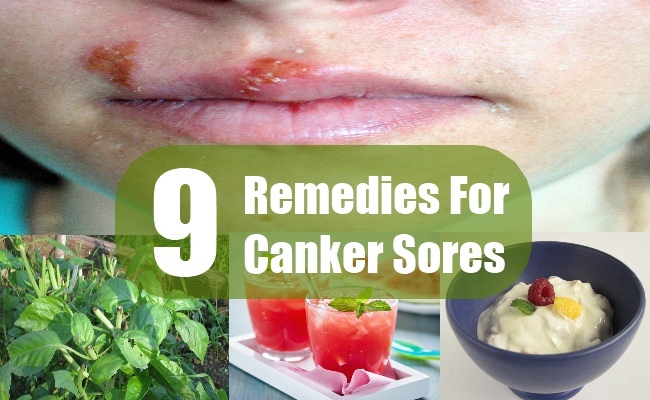 There are effective home remedies for treating canker sores. You can try these home remedies before getting yourself medically treated for the same. Alum is used in many astringents and is easily available in general stores. It comes in chunks of solid. Finely grind a medium sized chunk to powder form. Take a teaspoon of the alum powder and mix it with very little water to form thick paste.Apply this alum paste directly over the canker sores and leave for 15 minutes. After 15 minutes, rinse your mouth using plain water. Re-apply the alum paste every three hours to get rid of the sores fast and to arrest their spread. You should regularly use alum powder mouth wash if you tend to suffer from canker sores frequently. Indian lilac or neem has been used since centuries to cure many conditions of the mouth especially those caused by infection. In fact, during olden days the stems of the tree were used for cleaning the teeth. The medicinal leaves of neem are very effective in treating canker sores as well. Boil handful of neem leaves in water for 30 minutes. Strain the liquid and discard the boiled leaves. Use the resulting water for rinsing your mouth before and after every meal. Chewing on fresh neem leaves is also recommended for treating canker sores. However, the leaves are extremely bitter in taste. Therefore, mouthwash is a good option. Keep up with this treatment even after the canker sores disappear. Neem leaves will keep your mouth fresh and clean at all times thus reducing chances of infection. Basil leaves are also excellent for treating canker sores because of their many medicinal properties. You can chew basil leaves to treat the soreness and pain felt due to the infection.You can also prepare mouthwash at home using fresh basil leaves. This mouthwash will keep your mouth germ and infection free at all times. Onion works much like garlic in treating canker sores. The enzymes present in the onion juice effectively kill the infection causing bacteria and also arrest their further growth. Eat one raw onion every day for treating the sores. You can also apply onion juice over the canker sores to fasten their healing.Grate a medium sized onion and squeeze the juice of the grated onion. Use your clean index finger to apply the juice inside the mouth. Perform this treatment four times a day until the sores disappear completely. This treatment will take 3-4 days to work. Use drinking soda as a mouthwash for cleaning the mouth after every meal. The bicarbonate of the soda will effectively kill the micro-organisms causing the infection.Rinsing your mouth with drinking soda will also get rid of the food particles stuck between your teeth. The infection causing bacteria feed on these food particles for energy that is responsible for their rapid multiplication. Wash and chill the used tea bags and then put them against the canker sores. Tea has tannin that greatly helps in reducing the pain and inflammation caused by canker sores.This greatly helps in treatment of the sores. You can apply tea bags on the sores any number of times during the day; the more, the better. Hydrogen peroxide is a chemical that is strongly acidic in nature. It also has bleaching properties. Do not use the chemical undiluted for treating canker sores. Mix one capful of hydrogen peroxide with 200ml of drinking water. Rinse your mouth 3-4 times a day with this weak solution of hydrogen peroxide. This mouthwash is also helpful in the prevention of canker sores. Use fresh plum juice for treating canker sores. The enzymes present in plum act upon the infection causing bacteria and successfully eliminate them.You can either drink three glasses of fresh plum juice every day or apply the juice 3-4 times over the canker sores daily. Plain and cold yogurt is known to provide immense relief from the inflammation and pain caused as a result of the sores. East two bowls of plain yogurt every day to treat the infection. Apply the yogurt over the sores to reduce the pain and inflammation. Yogurt contains live culture of good bacteria that help kill the infection causing bacteria. While these treatments will help you deal successfully with the canker sores, it is also important that you take good care of your diet. Take required amounts of protein and vitamins in your daily diet to boost the immune system. Keeping the immune system strong gives our body the strength to fight and ward off the infection causing bacteria. Also, maintain a diary of the foods that are responsible for the formation of canker sores. Many times our body does not react well to certain types of enzymes and chemicals present in certain foods. This results in the formation of canker sores. Avoid these trigger foods once you have identified them. This entry was posted in Cosmetic Treatments, Home Remedies. Bookmark the permalink.